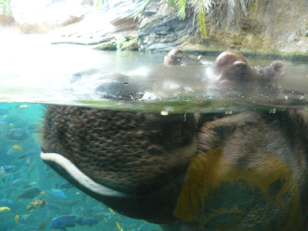 Orlando vacation - Day 2 - Animal Kingdom and more! 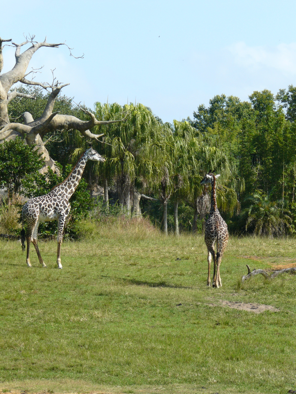 It was our first full day at Disney World and we decided to head to Animal Kingdom first and head right to the safari trip. It was quite fun - I got to see giraffes and Char saw elephants, so we each ended up viewing our favorite jungle animals and getting some pictures. 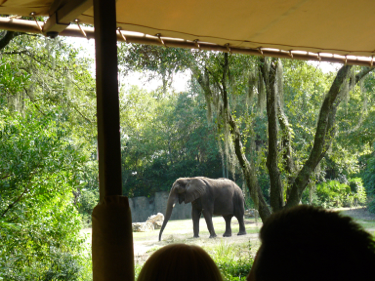 The rest of Animal Kingdom was also good - its basically a big African zoo, so you can't go wrong. 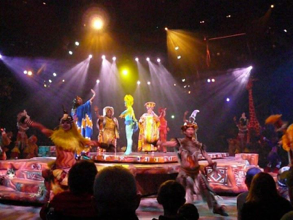 In the afternoon, we took in the Lion King show, which was absolutely tremendous. Just a fantastic live performance. The Finding Nemo musical was also fun, but slightly less awe inspiring than Lion King. After wrapping up our day at Animal Kingdom, we were going to hop a Disney bus to Downtown Disney to have supper and do some shopping, but that turned out to be a transportation option not offered. So we grabbed a bus for Hollywood Studios instead and spent a couple of unplanned but just as fun hours there. The Star Wars "Star Tours" flight simulator ride was great, and we also saw the Muppets 3D show, which was exactly what you'd expect from the Muppets so totally worth it. All in all, a very good start to the Disney World experience. The only minor glitch in the day was that we got rained on a bit while waiting in line for Lion King. Tomorrow: The plan is to go to Magic Kingdom for the day.